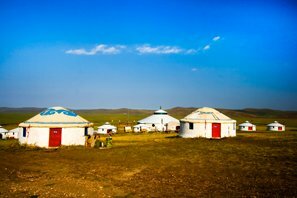 Address: 13 Hutongjia, Maojiawan, Dongcheng District, Beijing. 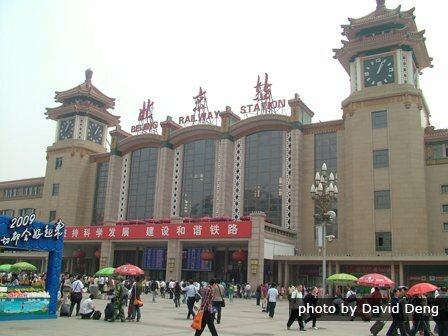 Beijing Train Station is Beijing&apos;s oldest (1959) and most central station. 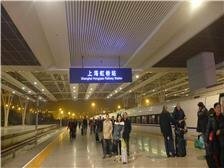 It is Beijing&apos;s main regular train station for regular lines going all over the country and internationally, and it has a bullet train line towards the northeast. 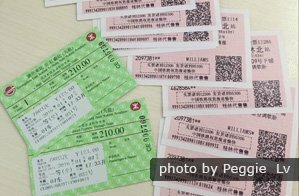 Bullet trains from Beijing South Railway Station and Beijing West Railway Station can take you to most of China&apos;s popular tourist areas. Covering an area of 25 hectares (50 football fields), Beijing Railway Station faces a 6,500-sq.-m. (1 football field in area) square to the north. Six VIP halls, one cushioned seat waiting hall, four ordinary waiting halls, and four key passenger waiting halls are available. 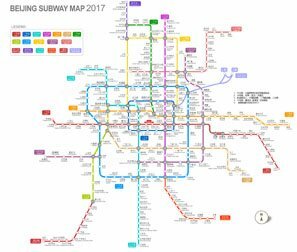 The underground area has Beijing Metro Line 2. Ask the service desk staff in the middle of the second floor if you need help getting your luggage on board or for other help. The official porters wear a red cap (10 RMB for a small bag and 20 for a large bag). See How to Get On/Off a Train and 7 Things to Know Before Riding a Train . 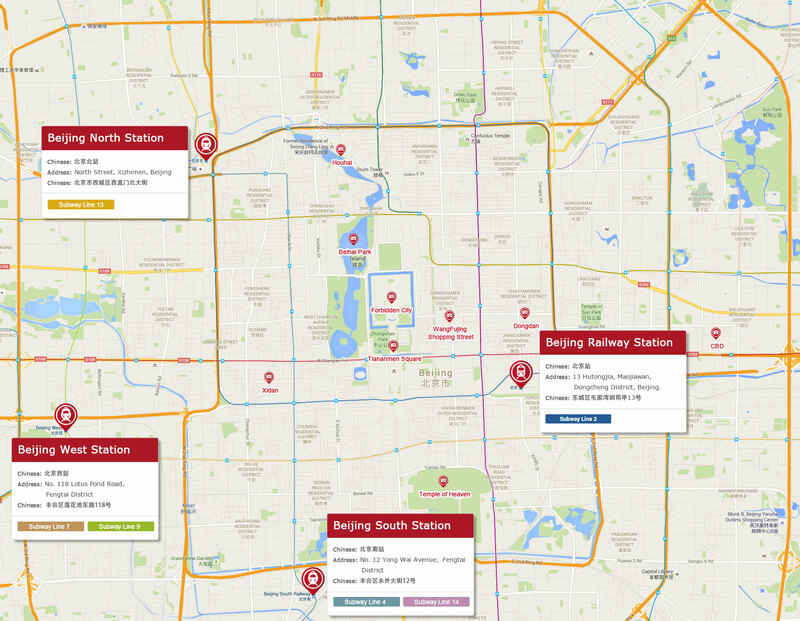 Click to see a larger map of Beijing Station&apos;s location in the city. 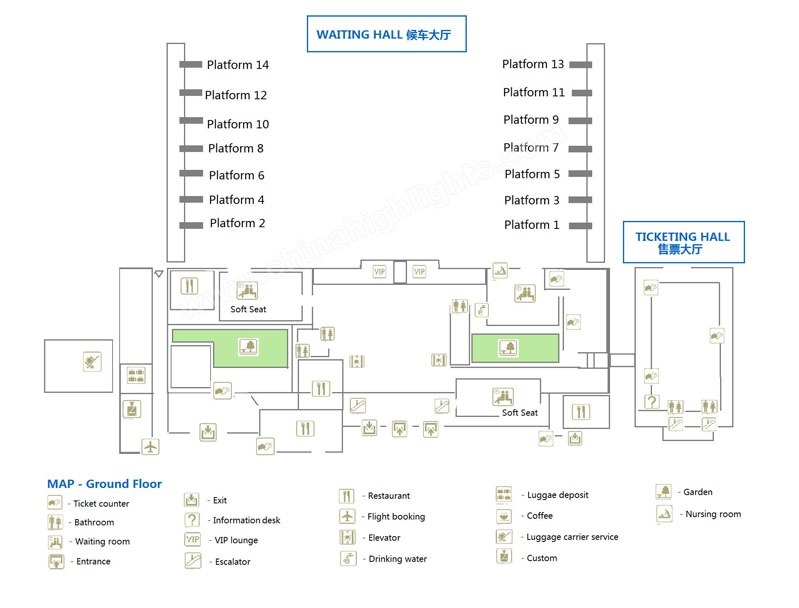 Because there are five train stations in Beijing, travelers sometimes go to the wrong station, so be clear about your station when making your way there. Waiting areas: It is best to use the taxis at the taxi waiting areas for safety and security, since guards are watching. 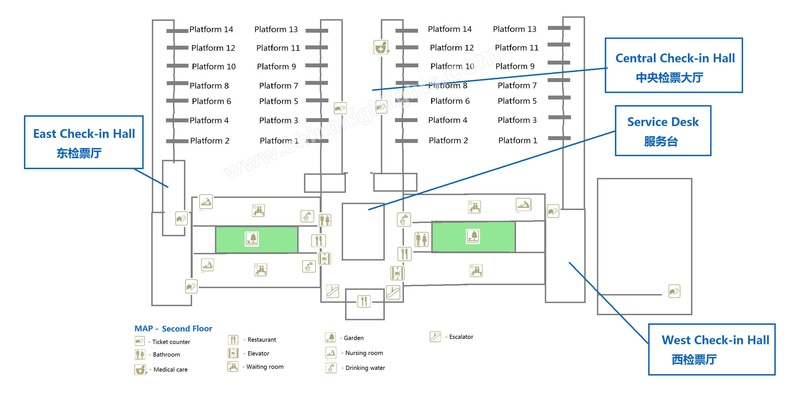 There are two waiting areas. The bigger one is in the northeast corner of the plaza with the greater number of taxis, and a smaller one is across the street. For specifics on fares etc., see Beijing Taxis. Take Line 2 to Xuanwumen Station (宣武门, 4 stops), then Line 4 to Beijing South (3 stops). About 25 minutes. Take Line 2 to Xuanwumen Station (宣武门, 4 stops), then Line 4 to Caishikou Station (菜市口站, 2 stops), then Line 7 to Beijing West (4 stops). 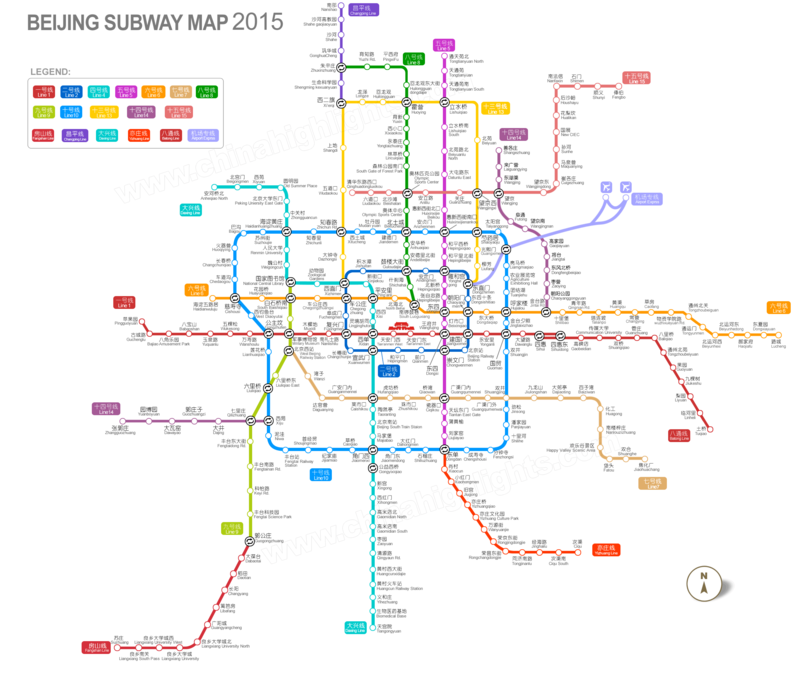 See our Beijing Subway Map. 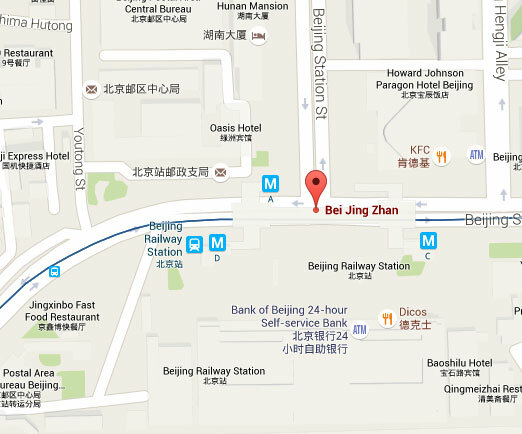 Take Line 2 west to Qianmen (前门, 2 stops) and walk north across Tian&apos;anmen Square to the Forbidden City (700m). 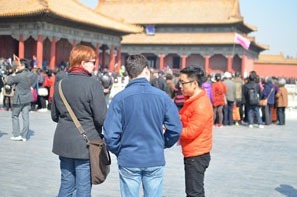 Walk around the Forbidden City for the West Entrance (1 km) to go in. Line 2 to Xuanwumen (宣武门, 4 stops), Line 4 to Xizhimen (西直门, 9 stops), and Yanqing S2 Suburban Railway Line to Badaling. We can assist you with booking tickets.